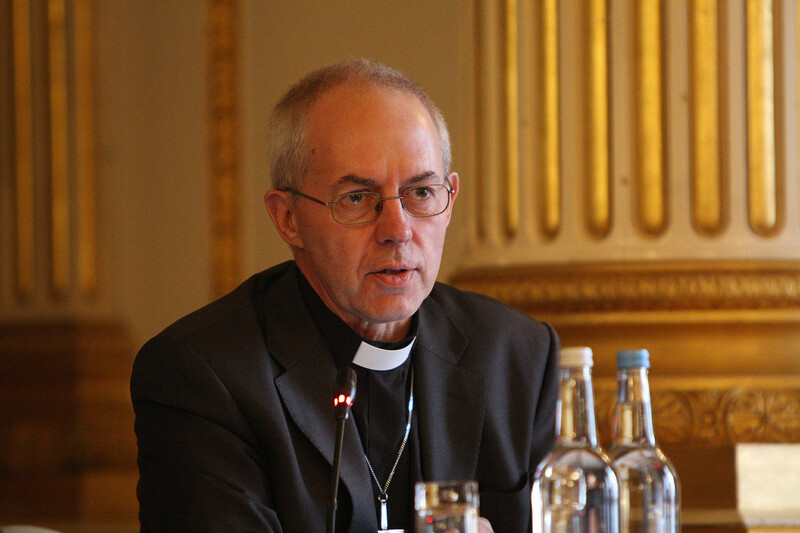 The Archbishop of Canterbury Justin Welby has said that it is not racist to be anxious about migration. The Archbishop added that there was a ‘genuine fear’ in ‘fragile communities’ about the impact on housing, employment and health services. There is a tendency to say ‘those people are racist’, which is just outrageous, absolutely outrageous. This is one of the greatest movements of people in human history. Just enormous. And to be anxious about that is very reasonable. He praised the UK’s ‘absolutely superb’ humanitarian work in refugee camps surrounding Iraq and Syria. However, he said the UK’s pledge to resettle 20,000 refugees by 2020 was ‘very slim’, especially compared to the number accepted by Germany. I was in Berlin, and the churches there are doing the most extraordinary things, as are the German people. We have to be careful. I’m aware of the complexity. The Government is rightly concerned about effectively subsidising people smuggling. But we can’t pretend we’re not part of this issue. We’ve got to find ways of taking our share of the load. Iain Duncan Smith has welcomed the Archbishop’s ‘rational’ comments. You wonder just how late they [the comments] come from various people in institutions. He said that accusations of racism probably silenced legitimate discussion. @BBCNews @JustinWelby What would Jesus say? Surely Christianity teaches tolerance and internationalism. God's earth, no boundaries? @BBCNews Migration fears *needn't* be racist. But too often are. London Multimedia News asked students at Goldsmiths, University of London, how they felt about migration, and whether thought it was racist to talk about migration. Paden Vaughan, a journalism student, thinks that current talks about migration are not very respectful. I don’t think it’s racist to talk about it [migration]. I think it is something that should be talked about. But I think the way in which it is talked about is, at the moment, not very respectful, and that you need to talk about immigration in a way that actually understands that these are people rather than just statistics. Well I’m an immigrant, I’m from Germany, so I feel very positive about immigration. I think the way a lot of politicians talk about immigration is racist, because they only ever see people with a different skin colour than there’s as immigrants. People who come from other European countries to England for example, they never perceive them as immigrants, so the way they talk about it is racist I think. The Archbishop has held his position since 2013. He told the magazine that he is ‘concerned with the nature of debate on the EU referendum. He said he felt the referendum debate was not yet addressing questions about the UK’s role in the world. My hope and prayer is that we have a really visionary debate about what our country looks like. He called on those who want to leave the EU to address a number of questions, such as, what would the UK look like having left the EU, and what would be its values. He also called on those who want to remain within the EU to set out how the UK could change the European Union and make it more effective. Both the Church of Scotland and the Vatican have opposed the idea of a Brexit. Archbishop Welby said there is no ‘correct Christian view’ on it. You can’t say ‘God says you must vote this way or that way’. I don’t think there is one correct Christian view, one way or another.